Rainy continues to train as an agility cat. 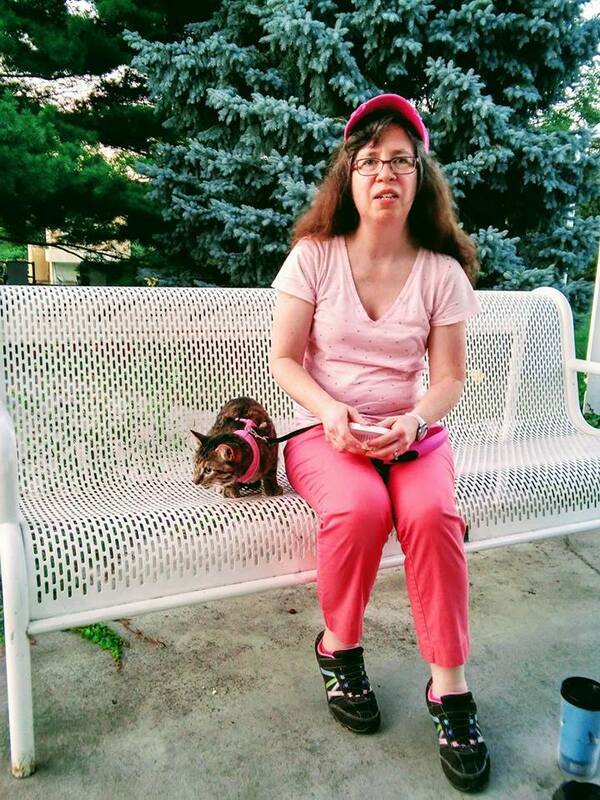 Her veterinarian has also signed papers needed for her to train as a therapy cat. I’ll write more on that later. For now, let me tell you about our past week. It included our return to a nearby park, introduction to a puppy, and a social with one of my friends. I’ll start with our return to a nearby park. As usual, I took Rainy to the park in our pet stroller and then let her out on leash when we arrived. As she sought refuge underneath a bench, I sat and sweated and tried not to have doubts about our goals. A father and his son stopped to chat with me. The boy was wearing a hat with cat decals. He wanted me to see it and to know that he liked cats. His father told me that his son liked the speed of cats. After the two left, I picked Rainy up and placed her on the bench beside me. She didn’t try to get down but instead ate goat cheese from my hand. I decided to push her to the next level by walking around with her in a grassy part of the park. Rainy sat and politely refused to budge. Her ears remained perked and her eyes stayed wide, vigilant to the activities and noises around us. Not being able to get her to relax, even with treats, I placed her back on the bench. When we had enough of the heat, I encouraged her to walk with me to the park entrance. Rainy showed no resistance to this idea and seemed to enjoy the short stroll, perhaps because the nearby bushes gave her a stronger sense of security than the more spacious grassy area had. One might say our outing was a partial success. But I had doubts due to her slow progress, enough that I decided to ask questions at some Facebook groups. First, I posted in a cat agility group. Unfortunately, no one in the group could offer any advice. Cat agility is still in its infancy. While there are at least two professional organizations that host cat agility shows, no one in my group has ever tried training their cat to do agility outside of the privacy of their home. Having struck out with the cat agility people, I next posted to International Cat-Assisted Therapy (I-CAT). Why does cat therapy have to do with agility? Well, if Rainy is to do agility outside of our home, she needs to feel comfortable with new people and places. And if she can be comfortable in strange situations, she might as well become a therapy cat, right?! To be honest, I’m still figuring out the best ways to meet Rainy’s needs, hence, the questions I posed to the therapy group. This time I got better results. The therapy group’s members graciously told me about how they had started with small INDOOR spaces, then moved to bigger INDOOR spaces, and only then ventured OUTSIDE. A few mentioned that their cats didn’t particularly care for the outdoors. Nonetheless, many did fine with the hustle and bustle of hospitals and schools. Their responses renewed my hope! For our second adventure, I decided to introduce Rainy to a new dog. The cat therapy group members advised me that therapy cats may very well encounter dogs. I admit that this makes me nervous. After all, some dogs and cats are mortal enemies—especially those dogs with a strong prey instinct. For that reason, I will always want to closely monitor Rainy’s encounters with dogs. In this instance, however, I feel relatively safe. The dog we’ll meet is a three-month-old toy poodle named Toby. He belongs to my in-laws. We have a toy poodle of our own, and so Rainy is already comfortable with the breed. Puppies make me less nervous because their lives are centered around play. And if we’re going to continue to take our pets with us when we visit my in-laws, Rainy and Toby need to get acquainted. All the same, Andy and I took precautions. I sat with Rainy in our in-laws’ dining room and let her simply observe their dog from the safety of my lap. Rainy and Toby were curious about each other, but neither pulled out their claws or bared their teeth. Next, we put Rainy and Toby on opposite sides of a baby gate. Then we dropped morsels of food and let the two of them sniff each other through the gate. Again, they remained friendly. Success! For our final adventure, I took Rainy with me when I went for a walk with a friend. My friend walked Barnaby and I pushed Rainy in the pet stroller. We visited the Hamann Rose Garden. 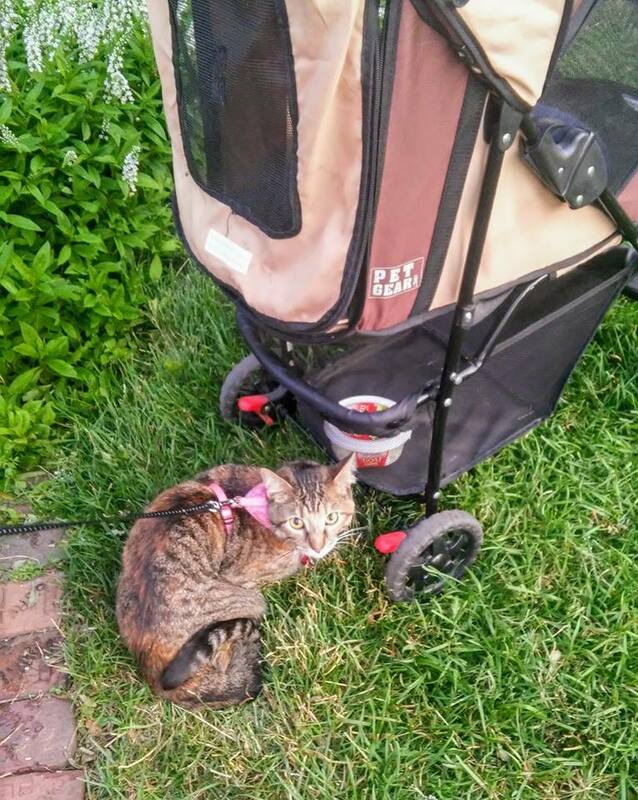 When we reached the first gazebo, I unzipped the pet stroller to give Rainy some food and water. She immediately wanted out to explore. On the ground, she sniffed the bushes and listened to the rush of traffic. As with the park, I then deposited her next to me on a bench. To my surprise, she curled up next to me and seemed content. My friend took photos. We caught up on news while the pets relaxed. Eventually, I returned Rainy to her stroller, but only because it was getting late and not because she had requested it. I’m not sure what was different about the two locations, but Rainy seemed truly comfortable on this outing. What a great way to end the week! Reprinted with permission from Lincoln Animal Ambassadors Pet Talk. This article is original in content and not to be reproduced without permission. Copyright 2017. 6 Responses to "The Cat Training Series: Rainy Meets a Puppy and Explores a Rose Garden"
we take our Lucy out on walks …always on a leash as we live in the mountains….she’s an active cat- agility would be fun for her! Have a great day today! If Lucy enjoys walks on the leash, she might like being an Adventure Cat! Yes, I imagine she’d like agility too. Our basement is now setup with a course for our cats. Success with Rainy. It’s patience you both need. It will happen as some point and she’ll have a doggy friend. Our dog Barnaby and Rainy often eat treats together and sometimes will sleep together. I think eventually my parents-in-law dog, Toby, and her could become playmates too. Continued best wishes, Allison, in training Rainy as an agility and a therapy cat. Thanks! Since our move, I’ve been doing clicker training with the cats too. That will the subject of my next article about her!